Quality gifts and home furnishings including Annie Sloane paint. We are a homestyle, interiors and gifts boutique shop based in the busy Market Place in the lovely market town of Pickering, North Yorkshire which opened in February 2011. Specialising in French and English Country Chic inspired furniture and interiors, fabrics by Clarke & Clarke, Annie Sloan and Voyage, interiors for the home. We also offer an upholstery service, lampshade making, blind and curtain making, drawer knobs and advice on upcycling furniture. 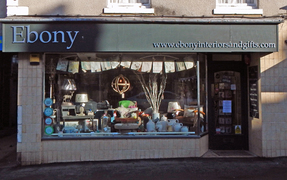 Ebony sells a lovely range of gifts for the home with starting prices of £1 but also sells statement pieces like vases, lighting, mirrors and furniture. We sell Chalk Paint™ decorative paint by Annie Sloan which is ideal for painting walls and furniture, Chalk Paint™ Paint Workshops are held within the shop. These are ideal if you would like to learn how to paint and distress furniture, stencilling, gilding, decoupage and crackle finish. If you want to upcycle your furniture by also changing the drawer knobs - come and see our extensive collection. We always have over 40 different drawer knobs in stock.